A Dollop of That! 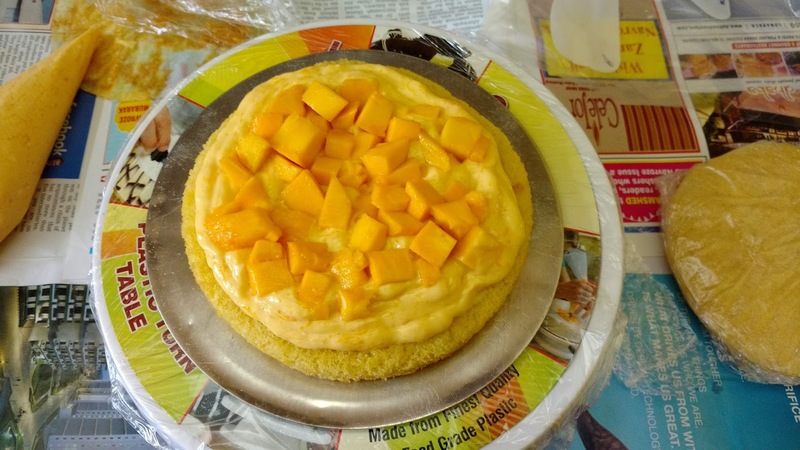 : Mango Cake with Mango Yogurt Frosting ~ ADOT's First Blogoversary! 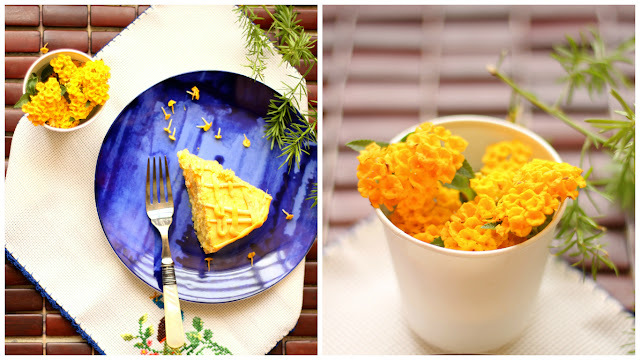 Mango Cake with Mango Yogurt Frosting ~ ADOT's First Blogoversary! Birthdays are always special, be they your own, a parents, a friends or your pets. But a first birthday is even more special, one throws the best of parties, dresses up the baby in the cutest possible finery and invites one and all to bless the child and enjoy a feast. Today, exactly 365 days and fifty one posts ago, on a warm May afternoon, I sat down at this very computer at my parents' home and typed my first post. Since I didn't know how and where to start writing and didn't have any pictures either, I thought of starting with what I cooked best, and loved eating. 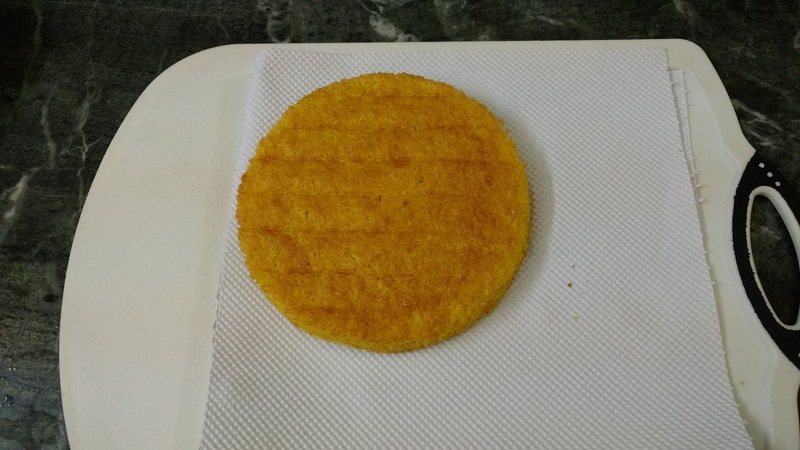 Hitting a homerun with Dhansakh a popular dish from India's Parsi cuisine, I diligently sat and typed the entire recipe from my mind, for I had cooked it so often. Today fifty two weeks later, I sit here a proud mum, for my baby is all of one. I know that it still falters, it cant walk to well and is still taking "baby" steps in a sea of food blogs. But that's okay, as long as there a few people who read this space, who like what I write, who like the pictures that I put up and most importantly enjoy and recreate my recipes, I am eternally grateful and thankful to each and every one of you my dear readers. Birthdays are hardly any fun without cake and in my opinion life itself is rather dull without some. 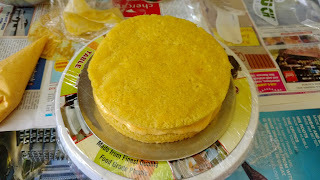 Mangoes are in full season so making the most of both good things, I created this delicious Mango cake using my trusted fruit based chiffon cake recipe, you may recall this recipe from the Pinacolada Cake I made last year for a friend's birthday. Light, soft, spongy and bursting with fruity flavours this chiffon cake recipe is a major crowd pleaser, though the bonus is that the cake derives its structure from egg whites, relying only minutely on flour and sugar, thus cutting the guilt of chomping down a piece or two. However cakes hold bad reputation for the calories that they copiously dish out from the frosting vis-a-vis the cake itself. To be honest the calorie loaded frosting bothers me a lot as well and I have been on the lookout for a low cal, healthy frosting recipe for a while now. Imagine my pure delight when I chanced upon one that was made from fresh pureed mangoes and hung curd here. There was no stopping me from making this delectable mango cake then. 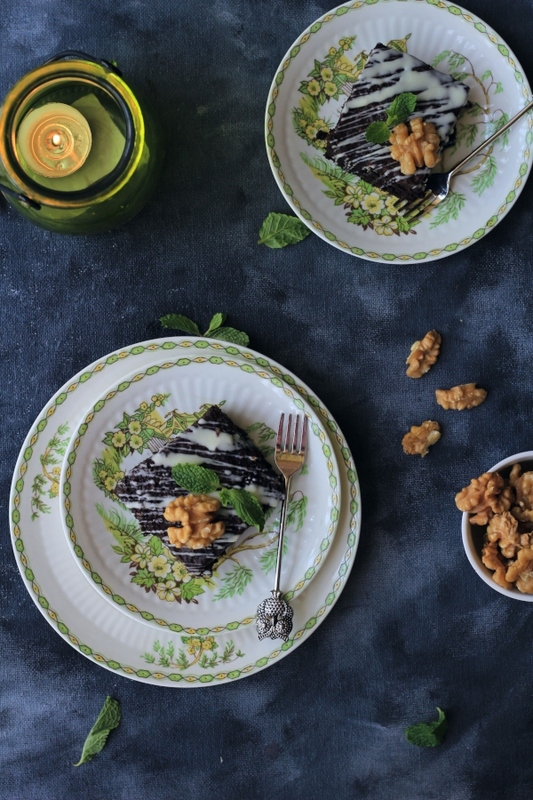 Read on for the recipe, then go make yourself some while mangoes are still in season. Makes: A 2 layered, 9 inch round cake. - Add in oil to the yolk mix and whisk again. - Next add in 1/3 cup mango puree. 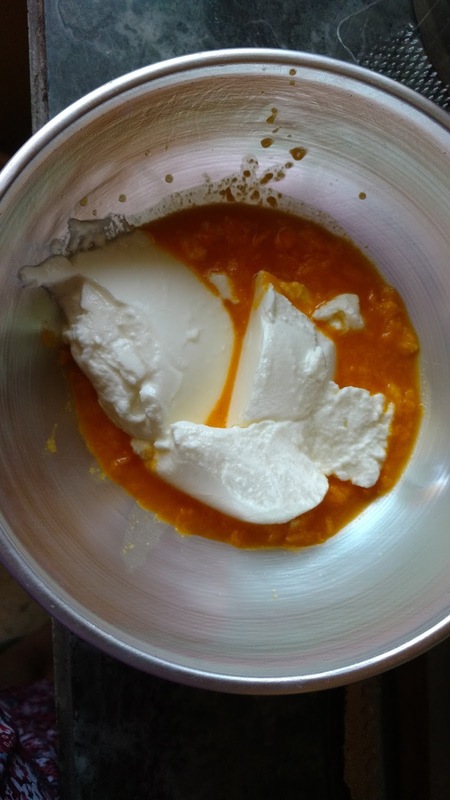 - Now add in the dry ingredients to the yolk mixture whisking very gently until combined. 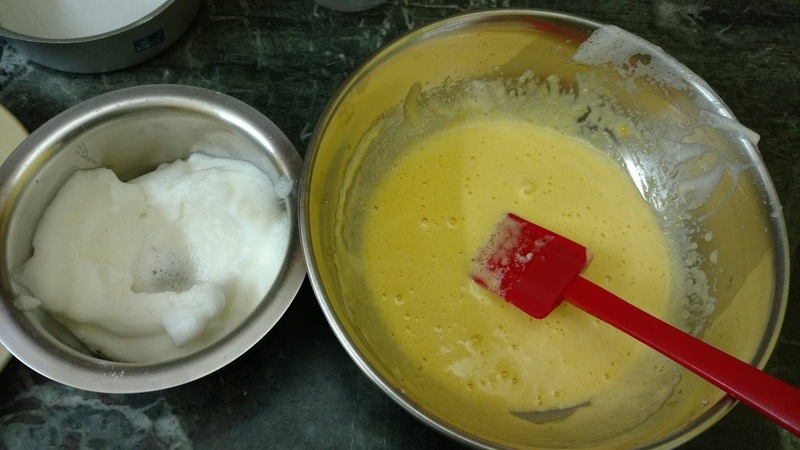 - Take 1/3 of the egg white mix and add it to the yolk mixture whisk gently till combined. - Now add in all the remaining whites and fold in gently with a spatula, making sure that you do not deflate the whites as you fold. 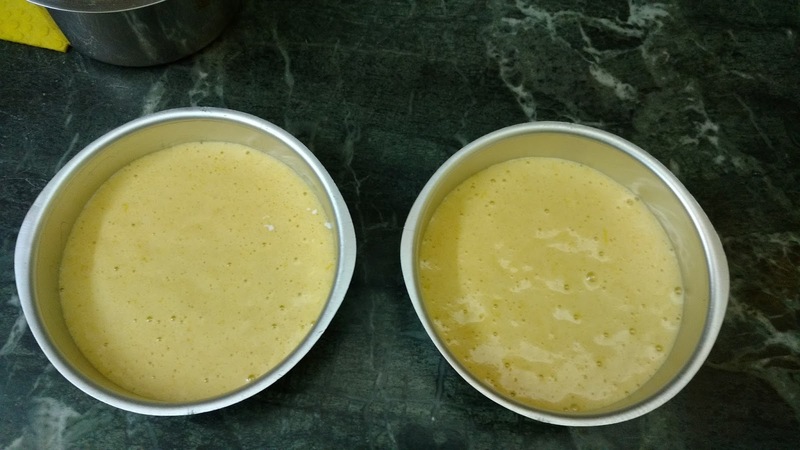 - Pour the batter gently in an un greased but bottom lined with parchment paper pan. - Bake in a preheated oven for 20 - 25 mins @ 162 degrees celsius. - Wrap in cling film and refrigerate for atleast 30 mins. 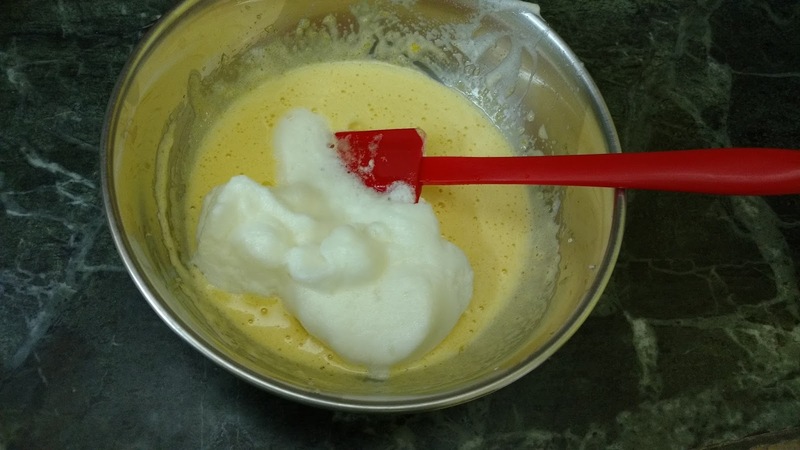 In a bowl put in all the ingredients, the yogurt, icing sugar, mango puree, vanilla extract and mix with a whisk until there are no lumps. -After the cakes are completely cool, pierce the cakes with a skewer or tooth pick and sprinkle half of the sugar syrup over one of the cakes. This will help to keep the cake moist. -Using a spoon, carefully spread the prepared frosting over the cake and top with diced mango pieces. -Place the other cake over the frosting and mango pieces and pierce the cake all over with a skewer or toothpick. Spoon the remaining sugar syrup over the cake. -With the help of a palette knife, spread the frosting all over the top and sides of the cake. - Decorate with your desired pattern. - Refrigerate for 30 mins before serving. 1. Chiffon cakes with their moist lightness work best with fruit purees, feel free to substitute mango with any fruit puree of your choice e.g. banana, strawberry, apple etc. 2. Since chiffon cakes get their structure from eggs, they are cooled upside down, else they tend to collapse on themselves. Many many happy returns of this special day...wishing you many many many more.The cake looks yummm..love the soothing colours in the photos😍And a yogurt frosting is like sone pe Suhaaga.